if you take a look to iOS Preferences, you’ll see there is a Searchfield under the NavigationBar Title. As far as I can tell, it is only possible with Xojo to place ToolButtons within the NavigationBar. Is there a Declare to place an iOSTextField below the NavigationBar title? This can actually be accomplished by just making it the first row of the table. You’ll just need to set the initial offset of the table so that the second row is at the top. Could you please go into more detail? What’s with the line between NavigationBar and the iOSTable you suggested? I believe it’s just a section header. 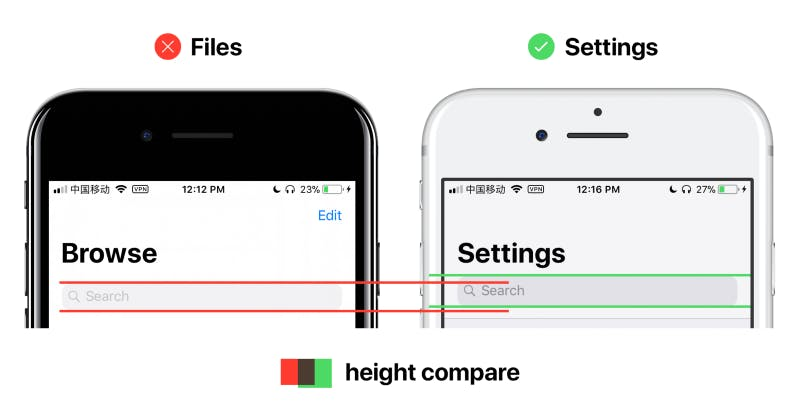 First of all, if you’re filtering the data in the iOS table, this will be easier if you use a data source as you can change the contents on-the-fly. Basically, you’ll want to have the data source return n+1 sections, in which section 0 returns an empty title, and row 0 of section 0 returns a cell containing the search field. You’ll probably want to hold an instance of that cell in a property so if the table scrolls you don’t lose the users entry. Doing a little research on Apple's website, there’s actually a special view controller for searches. From what I’m reading, iOS 10 and below used a technique similar to what I described above, albeit putting the controller in the header to the table. In iOS 11 and above, the search controller is something that you specify in the navigation controller for the view. I'm currently working on implementing a search bar in the navigation controller. I will post an example project when it is ready. · Greg O, Jason T and Martin T like this.